Posted October 2012 - In the fall of 2012, El Niño and La Niña global weather systems battled to a draw. Now it is anybody’s guess if this will be a big snow season in California’s Sierra Nevada. On Monday October 22, a friend in Mammoth sent pictures of the season’s first snowfall at Mammoth Lakes. After an extreme lack of snow at Mammoth Mountain Ski Area last winter, locals like Phil are hoping that snowstorms will visit again soon. In August 2012, I visited Mammoth Lakes for the first time since the 1990s. I was surprised to see how little the core of the town had changed. Still, rampant development of the sub-alpine meadows around the edge of town looked unsustainable to me. In 2012, the town went bankrupt. At the same time, the Los Angeles Department of Water & Power (LADWP) made plans to exert its Mammoth Creek water rights. As has happened several times before, Mammoth headed deeper into an economic recession. During the winter of 2011-2012, Mammoth Lakes experienced the economic ripple effect of ski area layoffs. 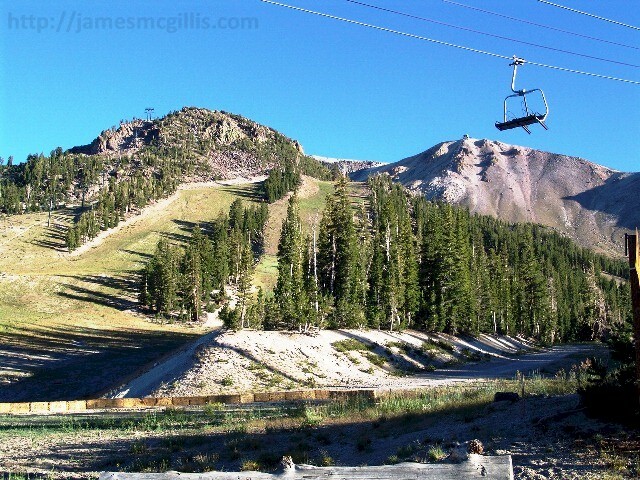 With the semi-permanent closure of June Mountain Ski Resort in 2012, it will take more than one great snow season for Mono County and its economy to rebound. Still, as the town of Mammoth Lakes goes, so goes Los Angeles. As a persistent western drought continues, few in Los Angeles stop to think how much of their water originates in Mono County. Collectively, we spent the past fifty years moving Los Angeles to Mammoth Mountain. Now, over-development and under-supply threaten water sources for both city and town. Perhaps a good 2012 – 2013 snow season will allow us to ignore both the economic and environmental realities/a> for yet another year. Go Sierra snow! Posted May 2013 - In 1959, I first visited Mammoth Mountain, California and the Sierra Nevada, the range within which that mountain resides. On the way north from Los Angeles, we could see Mount Whitney, which at 14,494 feet in elevation was the highest peak in the continental U.S. In summer 2012, when I made my most recent visit to Mammoth Lakes, Mount Whitney had grown to 15,505 feet in elevation. Was the Sierra Nevada changing that rapidly? The answer to that question is, “Yes” and “No”. If Mount Whitney gained more than a fraction of an inch in those fifty-three years, I would be surprised. What changed is scientists' ability to estimate the true shape of the oblate spheroid we call Earth. With ever more accurate satellite data, they can now accurately peg Mt. Whitney within a worldwide elevation database. Geologically, little has changed in the Sierra Nevada during those five decades. During that same time, what has changed in the Sierra Nevada and throughout much of the Western U.S. is the weather. The two words that come quickly to mind are, “warmer” and “drier”. Add to those adjectives, the term, “less predictable”. Winter storms can still hit with what feels like vengeance. Without notice, in November 2011 an unprecedented windstorm toppled expanses of forest without notice. Although a typical night-skier at Mammoth Mountain may feel the security of the nearby lodge, a hiker on the Mount Whitney Trail that same night might face death from exposure. In the 1960’s, snow at Mammoth Mountain seemed as reliable as clockwork. Snowstorms started in October or November, followed by an inevitable succession of winter storms. By Easter time each year, it could be sunny and warm on the slopes or cold and snowy. 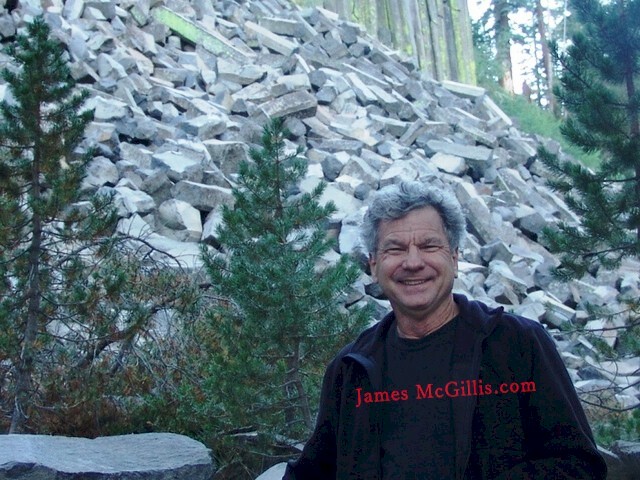 “Sierra cement”, as we called the spring snow, could fall one day after sunshine. In those days, snowmaking equipment did not exist in the Central Sierra Nevada. Most years, there was good skiing until Memorial Day. Even into the late 1980's, the mountain often remained open for skiing through the Fourth of July weekend. Gradually, yet inexorably, the weather patterns changed. In the late 1970’s, all of California experienced an extreme drought. First, the Golden State turned brown and then the skies turned black with smoke from ever-larger wildfires. An entire generation of toddlers learned not to flush the toilet unless necessary. Restaurants stopped serving water, unless requested. Auto repair facilities stopped offering complimentary car washes. California reservoirs were at an all-time low. 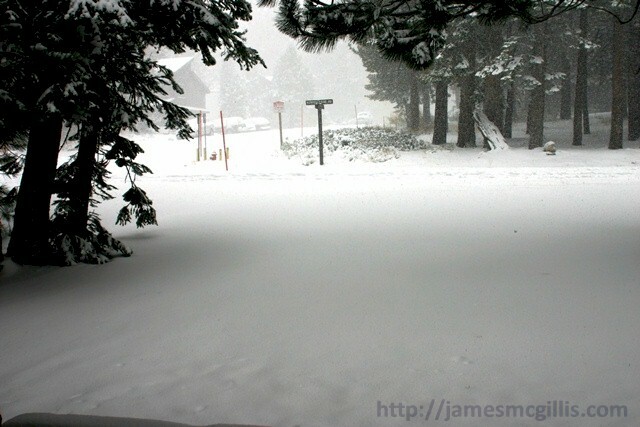 Then, after several years of drought, heavy snow returned to the Sierra Nevada. Almost immediately, water usage climbed back to pre-drought levels. “El Niño”, and his sister, “La Niña” were to blame for California’s erratic weather, or so we were told. When the fisheries off the coast of Peru experienced higher December ocean temperatures, California would soon feel the effects of drought. “El Niño”, in this case, referenced the supposed December birthday of the “Christ Child”. Although there is no record of Jesus having a sister, if cold ocean temperatures arrived near Peru, “La Niña” heralded cold, wet winters in the mountains of California. In the early 1980’s, the media began mentioning the “Greenhouse Effect” and later, “Global Warming”. “El Niño” events connected weather systems in both the Southern and Northern Hemispheres, it seemed. Yet the transport or communications mechanisms between Peru and California were puzzling. The milder term, “Climate Change” had not yet gained politically correct usage. As scientists documented the interrelationship of global weather and ocean temperatures, two camps developed. The first camp was the “Believers”. “If scientists tell us it is true, it must be true”, the Believers said. The second camp was the “Deniers”. “If scientists tell us it is true, there must be a vast conspiracy, so believe none of what they say”. Over time, a third camp arose, which I call “Rationalists”. This group says, "Over time, if I see it with my own eyes and feel it with my own body; I can determine what is true and what is not". In the 1960’s, the snow on Minaret Road was so deep, that rotary snowplows created a two-lane canyon leading to the ski area. In the 2010’s, the snowplows still make their circuits, but snow walls twenty feet high do not occur. In recent years, the snowstorms have arrived later in the fall and ended earlier in the spring. Overall, the ambient temperature is higher and the air is drier. In 2012, I asked Plush Kokopelli to spend the snow season at Mammoth Lakes and to report what he found. Although the first storms arrived late, during January and February 2013 more snow fell. Plush Kokopelli reported the possibility of a good snow year in the Sierra Nevada. Then, in March, things warmed up and it felt like spring in Mammoth Lakes. By late April, after a few brief storms, the snow season appeared to end. In late April, the U.S. Forest Service plowed the road around Lake Mary. Although the road remained closed to vehicular traffic, Plush Kokopelli took a hike around the lake. On that hike, he observed the ice begin to recede from shore. Upon returning the next day, all of the ice had melted, leaving open water where an ice field had so recently resided. California Department of Water Resources reports told us that as of May 2, 2013, the Central Sierra Nevada snowpack, including Mammoth Mountain, stood at twenty-three percent of “normal”. It may not be rational to send Plush Kokopelli to report on the weather from Mammoth Mountain, but for me, “seeing is believing”. The snow season appears to be over and a hot, dry summer in the Sierra Nevada awaits. Still, as of this writing, no one in California is mentioning the word, “drought”. Copyright © 2017 MonoJim.com. All rights reserved. Design by Savalas.net.